Photograph © Mike Baker - Used with permission. Perhaps named by the Pilgrims, the mayflower was suggested as the Massachusetts floral emblem as early as 1893 when the Women's Congress at the Chicago World's Fair (The World's Columbian Exposition) began promoting the idea of a "National Garland of Flowers." Two bills proposing the mayflower as the Massachusetts' floral emblem were introduced, one in 1900 and a second in 1901. Both failed to gain legislative approval. A bill to name mountain laurel the state's floral emblem was introduced in 1905. It too was defeated. A third bill in support of the mayflower, introduced by Representative Miles A. O'Brien, Jr. was the charm. Unfortunately a competing bill, proposing the water lily as the floral emblem, was also introduced. The General Court decided to pass the issue on to the Department of Agriculture who, in turn, passed the issue on to the State Board of Education. It was determined that a statewide vote of school children would determine the state's floral emblem. Put to the children of Massachusetts, the mayflower received more than twice as many votes as the water lily. 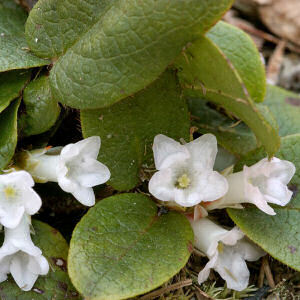 The General Court of the Commonwealth of Massachusetts on May 1, 1918, adopted the mayflower (Epigaea repens) also commonly known as trailing arbutus or ground laurel, as the flower or floral emblem of the Commonwealth. On May 17, 1925, Section 7 was amended to protect the endangered mayflower. The following information is excerpted from the General Laws of Massachusetts , Part 1, Title 1, Chapter 2, Section 7. Epigaea repens (Trailing Arbutus): Plant Encyclopedia from MyGardenGuide. Epigaea repens: University of Connecticut Plant Database of Trees, Shrubs and Vines. Plant Profile for Epigaea repens (Trailing Arbutus): USDA, NRCS. 2004. The PLANTS Database, Version 3.5 (http://plants.usda.gov). National Plant Data Center, Baton Rouge, LA 70874-4490 USA.